FRED DE SAM LAZARO, correspondent: Karachi is several hundred miles from the main conflict zone along Pakistan’s Afghan border, but the war resonates almost every day in this commercial capital of some 16 million people. Hundreds have been killed in recent weeks, some in targeted violence, some randomly, most across the ethnic divides. This largely Islamic country is comprised of several ethnic groups, each speaking a different language. Karachi is often shut down when one or another faction declares its own curfew. Residents complain that the police presence is usually late and feeble. Amid the deadly chaos, one of the loudest voices appealing for calm has been that of an energetic 84-year-old devout Muslim named Abdul Sattar Edhi. ABDUL SATTAR EDHI: I’ve been asking people one question. We’ve been Muslims for 1400 years. Why don’t we become human beings? Why have we lost touch with our humanity? God doesn’t just love Muslims. He loves human beings. DE SAM LAZARO: Pakistan’s and Karachi’s fledgling civilian governments are simply not up to the task of bringing order, he said, imploring the country’s top military leader to intervene. 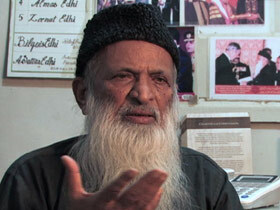 ABDUL SATTAR EDHI: Mr. Kiyani, I am appealing to you. Where have you been sleeping? DE SAM LAZARO: Edhi moved to Karachi from western India not long after Pakistan’s creation 62 years ago. He began an ambulance service in the 1950s, trying to serve a city that was growing rapidly. It now has the largest fleet in the city—mostly simple vans with stretcher, lights, and siren. Partly because the country has few such services, the Edhi Foundation has also grown into one of its largest social service agencies. Edhi, who had little formal education, boasts that his entire budget of more than $10 million comes from ordinary Pakistanis. To demonstrate, he stood on a busy Karachi street for about 15 minutes. Dozens of passers-by thrust money in his hands. It has helped fund food relief in neighborhoods that have been under siege for days during the fighting. RUMANA HUSAIN: I don’t know where we would have been if Edhi wasn’t around, really. DE SAM LAZARO: In what sense do you mean that? HUSAIN: In every sense, because he seems to be everywhere. I mean, even if an animal gets hurt, and if there is a donkey lying somewhere or a crow falling from a tree, it seems that it is Edhi volunteers who pick them up. DE SAM LAZARO: Edhi has been partnered with his wife, Bilquis, of 40 years. She oversees facilities that house about 9,000: women in shelters, children in orphanages, schools, and this nursery for abandoned infants, most of them severely handicapped. 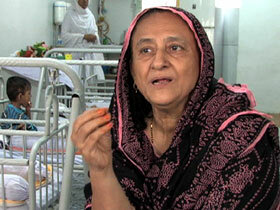 Bilquis Edhi began working as a nurse for Edhi’s fledgling organization. She accepted his marriage proposal even though he was more than 20 years her senior. She says she admired his dedication to serve, drawn from a deep religious faith. 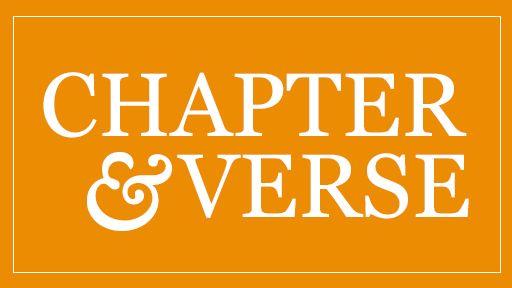 The flowing beard, a symbol of his religious practice, was not a plus, she admits. But today, in a more conservative Pakistan beards are common, but she says they are a false symbol of piety. BILQUIS EDHI: People had beards because they were practicing. Today there’s less practice but more beards. It is this high number of narrow-minded people that have created all of the trouble we have in our country. ABDUL SATTAR EDHI: When there is poverty, illiteracy, when people don’t get their rights that gives rise to organizations like the Taliban, and other such groups were formed, and it just spreads from that. DE SAM LAZARO: Experts say it’s much more than religious extremism that’s stoked the unrest. A lot of it stems from the way Karachi has grown. Modern-day Karachi has been defined by migration. In 1947 at independence, when the British partitioned India, millions of Indian Muslims flocked to the city. So did people from other provinces of the new Pakistan, like Punjab and the Northwest along the Afghan border, and migration from that troubled region skyrocketed after the Soviet invasion of Afghanistan and after 9/11. Today Karachi’s neighborhoods, its politics, and much of its strife happen along ethnic lines. 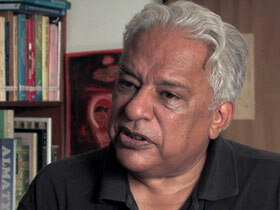 ARIF HASAN: Almost all of Karachi’s issues are related to the conflict in Afghanistan. Even the “ethnicization” of the city is related to Afghanistan. DE SAM LAZARO: Arif Hasan, a prominent architect and historian, says the divisiveness first came under Pakistan’s military ruler in the late seventies and eighties. Zia ul-Haq also introduced a strict religious conservatism, which intensified as Pakistan, with US support, closely allied with the Afghan mujahideen fighting the Soviet occupation. HASAN: And it was from this city that that war was fought, supplies, training, ideological training, the heroin trade that financed that war to a great extent, it all took place from here. Today, if you look the city, the supplies to the NATO troops all go through the city. Because they go through the city almost everyone has an interest in the city. The Americans have an interest. The Pakistani intelligence agencies have an interest. The Taliban are here, the Afghan intelligence agencies are here. They all have a presence. DE SAM LAZARO: Not present is any consensus on how to govern among the political parties, which are largely drawn ethnic lines, competing for turf in convulsions of violence that have taken a huge toll. HASAN: Every time you strike or the city closes down, apart from the formal losses that are made, at least half a million households don’t have any earnings on that day because they are day-wage earners, so poverty has increased considerably as a result. DE SAM LAZARO: On Karachi’s streets, Edhi says there’s growing despair. These men pleaded with him to help them get more police protection in their neighborhood. It is encounters like these that Edhi says prompted him to call for military intervention, much to the surprise of journalists at his news conference. Journalist: Do you want a dictator to come in, like Musharraf? ABDUL SATTAR EDHI: Brother, if for the time being you have to say salaam to somebody, there’s no harm. If a civil revolution comes in there will be anarchy and millions will die. What is needed for three to six months is somebody should come and control the situation. Journalist: Are you inviting martial law? ABDUL SATTAR EDHI: Brother, tell me if there’s a different road. DE SAM LAZARO: Pakistan has already been on the martial law road. Until 2008, this country was mostly ruled mostly by military men. Ayesha Tammy Huq, a lawyer and talk show host, doesn’t think there’s much yearning yet for their return. AYESHA TAMMY HUQ: We don’t want those people to come back and run this country. The military is responsible for a lot. They have run and controlled Pakistan for so long. The Afghan policy is theirs, foreign policy is theirs. Everything is the military’s, and so therefore we need to allow these terrible civilians who are so corrupt and so dreadful, we have to allow them a little time to get it together and to change the way things are done in Pakistan. DE SAM LAZARO: And it will be up to Pakistan’s civil society to hold politicians accountable, she says, much as it did during the rule of General Pervez Musharraf. Civic groups led by lawyers fought successfully to restore judges Musharraf had dismissed, eventually forcing out the general himself in 2008. 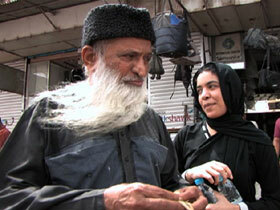 Abdul Sattar Edhi says he can only hope for that kind of change can happen in Karachi with a minimum of bloodshed. For now, demand for his services has never been higher. For Religion & Ethics NewsWeekly, this if Fred De Sam Lazaro in Karachi, Pakistan.